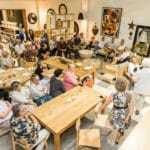 It was a full house at Mark Tuckey to hear the story of Nino Sydney’s Beachcomber house. From the first drawings, through to its four distinct house designs, Helen Thurloe revisited early marketing campaigns, as well as photos that showed the excitement of the home fairs in the 1960’s. A lovingly maintained Beachcomber II was awarded a National Trust Heritage Award in 2015. 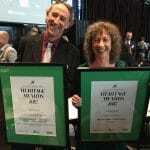 The award, for Conservation and Built Heritage, recognised the efforts of Billy Gruner and Sarah Keighery in restoring their original Beachcomber in Sydney’s Blue Mountains. The aesthetics of our suburbs was explored in the two-part series, Streets of Your Town – From Modernism to McMansionism. Screened on ABC TV in November 2016, it’s a journey around Australia with comedian, broadcaster & architecture enthusiast, Tim Ross. Beachcombers feature (briefly) in both episodes. An original Mark I Beachcomber in Sydney’s northern suburbs seeks a new home. Its current owners are redeveloping the site in May 2017, and are hoping that their vintage Beachcomber can be rescued and re-used by someone who’s after a 1960s classic.